I first heard Eva Salina sing over 15 years ago at Balkan Music & Dance Camp in the coastal redwood forest of west Mendocino County. I can’t imagine she was old enough to drive at the time, yet there she was, confidently and deftly belting out assorted Balkan folk songs alongside considerably more tenured singers from both the Balkans and America. She impressed me then and consistently over the years with her fluency & respect for the traditions she draws from, while concurrently making these songs all her own. At the age of 7, Eva taught herself to sing all the songs on Mazltov! A Yiddishe Nama which featured L.A. locals Pearl Rottenberg Taylor accompanied by the NAMA Orchestra. Eva was soon studying Balkan singing with Ruth Hunter in her home town of Santa Cruz, California and travelled for the first time to the Balkans when she was 12 years old. She has gone on to study with many others and was mentored by Ethel Raim, Kalin Kirilov and, as an undergrad at UCLA, with Bulgarian singer Tzvetanka Varimezova. 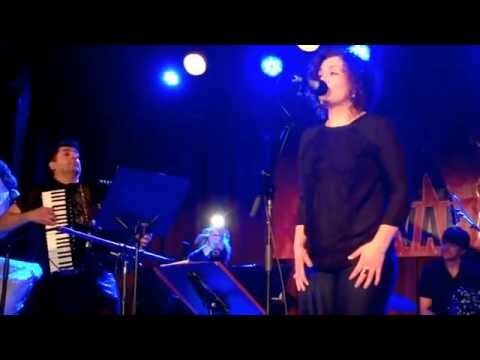 While she has contributed to numerous recordings (Bay Area based Edessa and New York based Slavic Soul Party & Choban Elektrik to name a few), Lema Lema marks Eva’s first major solo release; paying a loving and stunning tribute to the late great Romani singer Šaban Bajramović (1936-2008), from the southwest Serbian city of Niš. From the mid-1960s onward Šaban Bajramović was wildly popular throughout the former Yugoslavia and through its dissolution in the 1990s. Hailed as The King of Romani Music, Šaban Bajramović was a hard living, classic outlaw figure, but on Lema Lema, Eva seeks to shift the focus from the outlaw legend to Šaban Bajramović as fallible human being and tremendous singer. Speaking with Eva this February from her adopted home of Brooklyn, she shared that she chose Šaban Bajramović for this project because she loves his music but adding “I sound nothing like him”. Eva offered that she wanted to honor these Romanés language songs without attempting to replicate Šaban’s arrangements. Eva went on to say "As is the case in many musical genres, women are woefully underrepresented in Romani music", Eva sees this record as her small contribution towards changing that tide. On Lema Lema, Eva says that she intentionally did not push the mostly New York based musicians to “get it right” but when mixing the record later in Woodstock, N.Y. she realized the project needed a little something more from “over there,” so she took Serbian Romani trumpet player Ekrem Mamutović up on his offer to contribute to the project. She packed up the audio files and recording equipment and flew to Serbia to finish the recording with Ekrem at his home in the south. Prominently featured on Lema Lema is Eva’s long term musical partner Peter Stan, a Romani accordion player from Banat, the historical province that straddles the borders of NE Serbia, western Romania & southern Hungary. Also prominently featured are members of New York Balkan stalwarts Slavic Soul Party and Kultur Shock as well as Frank London of The Klezmatics, to name a few. Lema Lema is a wildly danceable record with no shortage of songs in traditional kolo, čoček, lesno, devetorka, jeni jol dance forms that are sure to be a hit with both the Balkan folk dance community as well as folks, young and old, who just want to get their groove on. For the “folk purist,” I’ll add that the instrumentation draws heavily from the great Balkan accordion traditions as well as the Romani brass band traditions. Keeping with the time period that Šaban Bajramović was recording in, Eva also enlists no shortage of vintage synthesizers and effects to great effect as well as Indian percussion which given the Romani origins in northern India; not at all uncommon in modern Romani music. I’ll share that when I went to the Balkans a dozen years ago to study kaval and ney (end blown “folk” flutes), I came away with tremendous admiration for the endlessly innovative and talented synth players who routinely backed up both traditional singers and instrumentalists in bars and restaurants. Instrumentation in the Balkans and particularly with the Romani community has always been “fluid” and I am reminded of Dr. Tim Rice of UCLA’s Department of Ethnomusicology carrying a synthesizer backstage at a Balkan dance event, saying “Make way for folk instruments.” In short, you would be sadly mistaken to dismiss this as anything other than a great recording, very much on the continuum of ever-evolving Balkan folk music. Lema Lema is an absolute delight from start to finish. A few early favorites include Akaja Rat with its playful calliope opening, unfolding into full throttle brass band, vintage synth and live roosters; the heart wrenching Djelo Djelo complete with soulful accordion breaks; classic Balkan brass band of title track Lema, Lema; and the near stadium rock arrangement of final track and Eva’s personal memorial to Šaban, I Barval Pudela, complete with Sgt. Pepper-esque trumpet fanfare. In short, Eva Salina has brought a really phenomenal recording into the tradition. It is very risky business to tackle the repertoire of such a respected and well known artist but Eva has done just that, infusing a lifetime of respect, passion and soul into these tremendous songs of one of Balkan music’s greatest treasures. To purchase Lema Lema and for upcoming July California tour info, visit Eva’s website. Pat Mac Swyney is a local musician & teacher who currently plays Traditional Jazz with The Swing Riots Quirktette and Old Time with The Dead Rooster Memorial String Band and Balkan with Nevenka.